Some memories stick with me—remaining as fresh now as if events only happened yesterday. They change the way I think and feel about places. One of my intense, site-specific memories is connected with a very special event which took place in the heart of The University of Queensland (UQ). The artworks of eight inspiring Aboriginal artists may no longer be on show in the University Great Court, but the echoes of Courting Blakness: Recalibrating Knowledge in the Sandstone University remain. 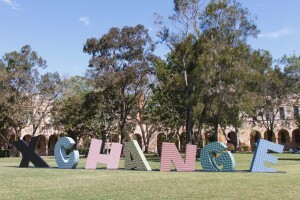 Courting Blakness was a public art installation (5-28 September 2014), a National Public Symposium, a website, and a book (published in 2015 by UQP). Curated by UQ Adjunct Professor, Fiona Foley, Courting Blakness brought works by Ryan Presley, Archie Moore, Natalie Harkin, Karla Dickens, Christian Thompson, Megan Cope, r e a and Michael Cook into the UQ Great Court. The opening weekend was an opportunity for celebration, recognition, debate, and exploration. The exhibition was opened by The Hon. Linda Burney MP, before performances by poet Telia Watson (Ancestress) and singer Lou Bennett. And then the multimedia artworks were screened on the walls of the Great Court. The Symposium coincided with the exhibition opening, where an inspiring keynote by Professor Larissa Behrendt set the scene for a sparkling, interdisciplinary two-day event—with presentations by artists, curators, commentators, students and academics. To attend a leading university, such as UQ, is an amazing privilege. A chance to build life-long friendships, study with inspiring teachers, conduct your own research, and expand your personal horizons. To learn, to think, to be challenged. The University calendar is full of public lectures, events, seminars, and panel discussions where casual conversations can lead to new avenues of research and experience. Sitting in the University Art Museum, listening to a 2013 interdisciplinary panel of academics talking about a proposed exhibition, I knew it was something I’d really like to see. “It’s such a great project. And so I had the opportunity to ‘tag along’ in the wake of Dr Fiona Nicoll (Project Manager). Every day leading up to the opening brought new opportunities, challenges, and possibilities. Sharing of information and ideas took place through a number of seminars, through the use of the University ‘Blackboard’ system, and through two Diversity Discussions—each attended by Elders, artists and leading thinkers—which were open to UQ staff and students. Even before the exhibition and symposium, the artworks inspired debates, presentations, exchanges, and new ideas. None of this would have happened without the work of the curator and exhibiting artists, and the dedication of many supporters, donors, and volunteers. Over $100,000 and at least 1,000 student volunteer hours donated. It was worth every cent raised, and every minute spent. But only as the artworks were brought into the Great Court did my experience of the space begin to change. It was just so wonderful to talk to student groups about the University as a place for their own studies and stories (and how it was not off-limits if they felt they didn’t have the ‘right’ heritage), to see the excitement of donors and supporters as the events began, and to be inspired by the student volunteers and interns who worked so hard to support the project. So… I am sitting on the grass in the Great Court. It’s dark. One of those lovely slightly-crisp-but-not-cold Brisbane evenings. The sky is clear and I can spot a few stars. The Great Court colonnades are lit with a slightly golden light, and I can see the shapes of students and staff as they make their way home. My husband is walking round, taking pictures of the artworks. The open-sided tent, used for the exhibition opening speeches, is almost empty. Just a few stragglers sitting, chatting about the speeches, reflecting on Lou Bennett’s singing, and recalling Telia Watson’s performance. Ancestress’ words are certainly still ringing in my ears. The grass is slightly damp. The flags of Archie Moore’s 14 Nations are hanging close by, and Ryan Presley’s Debt is just the other side of the tent. And ‘writing over’ the sandstone walls of the Great Court—the interior sandstone wall of the Law Faculty to be precise—is one of the multimedia artworks… The Blaktism, by Megan Cope. I am watching an award-wining artwork, in the heart of UQ—permanently remaking my experience of the Great Court. Courting Blakness will always be in the Great Court for me. And, I believe, for many others—as suggested in some of the student comments collected on video by student volunteer Dominic O’Donnell. An example of what Pierre Nora characterises as “Les Lieux de Mémoire”? For me, it has re-made the space. Every time I walk into the Great Court, I remember the installation, the artworks, the symposium, the volunteers, the donors, the curator, the artists, the speakers and performers. And I am straight back to that evening: sitting on the grass, in the dark, watching the artwork screened directly onto the sandstone. Dr Catherine A. Lawrence, Brisbane. BA (Dual Hons) Sheff. (UK) 1983, MA Qld (UQ) 2007. PhD Qld (UQ) 2014. Pictured: Debt (2014). Vinyl sticker on MDF board (180 x 1460 x 100 cm). Photo credit: Geoff Lawrence, Creative Futures Photography. Author’s note: www.courtingblakness.com was created with funding from the Alumni Friends of The University of Queensland. Developed to act as a valuable teaching, learning and research resource for the exhibition, the website is now a unique digital archive for future research as part of the National Library Pandora archive. This entry was posted in Art, Courting Blakness, Great Court and tagged 2014, Art, Courting Blakness, First in Family, Great Court. Bookmark the permalink.